I have spent the day finishing off the last of my stock, printing off the instructions for the ornament kits and packing everything up to go. I am very excited as this is my first proper venture selling my designs. I have done a craft fair before at Scouts to sell my ornies to fundraise for Project Nepal and sold them at work for the same reason but it will be nice to see if people like the things that I have made as well. 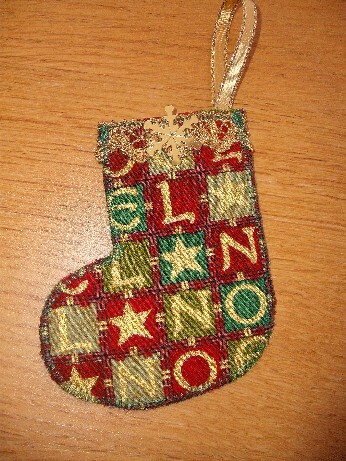 Yesterday evening and today I made two batches of little Xmas stocking backed with felt. 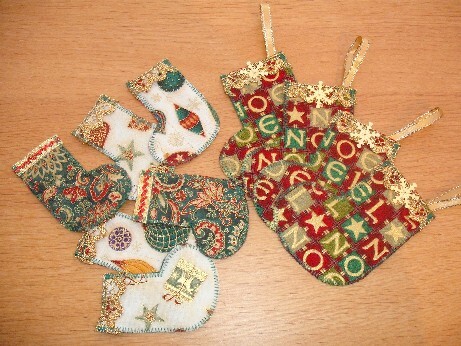 The little ones are meant to be just tree decorations but I thought the bigger ones could be used for giving Xmas gifts of money – they can be hung on the tree as well but I though they might be more festive than the cards and envelopes you can buy for that. I did promise myself that by the end of the year I wanted to design something and have a pattern published – well this is not really publishing but I have put together the instruction sheets with all pics all by myself so it sort of fits! I have made 10 little kits with everything needed except the pot! I am very pleased to be doing this (not only as it has given me a chance to play with loads of lovely Xmas fabric) as it has been a dream for a while to be able to run a textile creation business. I was hoping to do that a couple of years ago but life got in the way but if I can do bits and pieces that makes me very happy. I spend lots of time looking at blogs like Hen House and wishing I could craft full-time (not that the job isn’t lovely but playing with fabric all day would be heaven!). However one day it will happen. 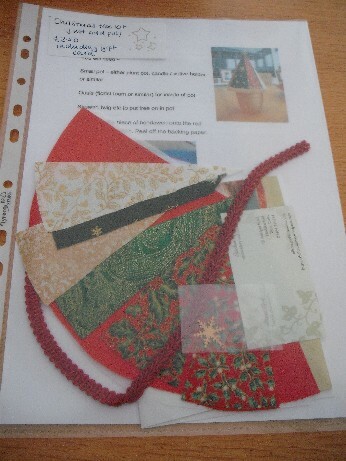 I don’t think I can add downloads onto this blog but if anyone wants a copy of the instructions for the Xmas Trees pot ornie (it is a Word file) then please leave me a comment with your e-mail address and will send you one. Will take lots of pics at the craft fair so that you can see my little stall – I do love Xmas! Thanks for visiting and don’t forget to leave a comment on my blogaversay post to win some Xmas goodies.